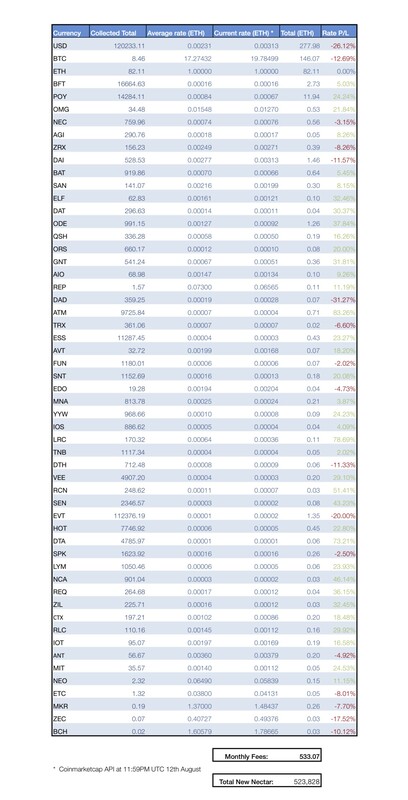 With an aim to provide our users with a clearer view of the inner-workings of a digital asset exchange, we publish monthly reports reflecting the trends of each previous 30-day period. The Ethfinex Governance Summit was announced August 24th. The Summit will bring together a variety of different groups, including Nectar holders, to discuss past and future approaches to governance. The 3-day event will culminate with an NEC meeting designed to lay the foundation for the future of the Nectar token. We also hosted our 2nd London Meetup on Wednesday August 22nd where we showcased a variety of developer tools relevant for the upcoming launch of Ethfinex Trustless. A short presentation of tools by Will Harborne was followed by a discussion on the value of decentralised exchanges and their role in the industry moving forwards. This following report breaks down monthly trading revenues, volume and user growth, and will continue to provide more detailed statistics each period. Total trading volume for August equalled 740 million USD for the month, a simple average of 23.87 million USD per day. Total fees of ~$692,000 (depending on price feeds) were collected through trading and other fees in the 30-day period. 533.07 ETH have been contributed to the Nectar token contract, pledged to NEC holders. 523,828 NEC tokens were distributed to reward market makers active on Ethfinex in the past month. Statistics can now be viewed on Nectar.community. This month the report includes new statistics on user numbers, activity, and further breakdown of fees. Fee currencies in the table are ranked in order of most collected. Quick note — fees cannot be extrapolated directly to trading volume as users can set their preferred fee currency (hence the popularity of USDT and BTC). The above chart shows 50% of fees in all currencies collected. 533.07 ETHwere collected during the month and pledged to NEC token holders. POLY in particular, as well as ESS, DTA, ATM, EVT and HOT pairs all performed well. The total 30-day trading volume dropped a little once again, reflecting the mixed market sentiment compared with generally lower trading volumes market-wide. 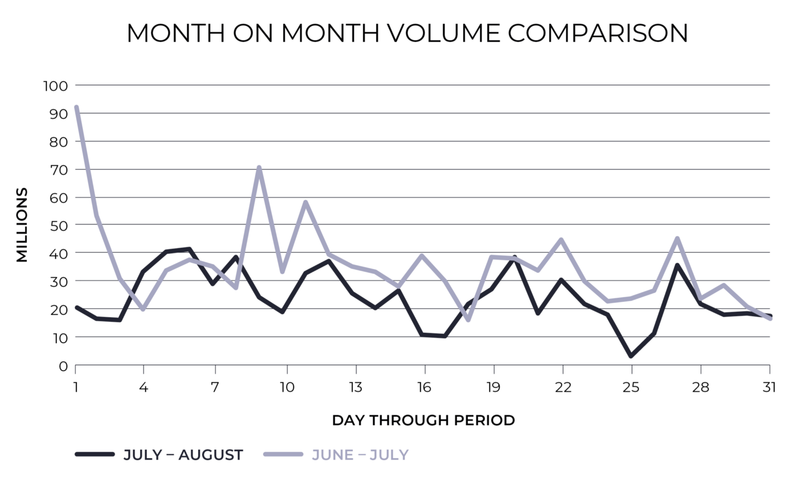 Our volume for the month of August was 740 million USD equivalent — compared with July (1.1 billion USD). The month user numbers were steady compared with previously, although ETH fell to a 12 month low, with most tokens dropping by an even greater percentage. Peak daily trading volume was 41.3 million USD, in line with the previous month, but with an average of just 23.9 million USD. The majority of the volume continues to result from the ETH/USD pair. On August 7th, The Ethfinex Voting dapp (Nectar.community) became the 3rd most used governance-related application on the Ethereum network out of 1791 great dapps. We launched Nectar.community five months ago, on April 2nd. Nectar.community was created to allow users to propose and vote on the immediate and long-term direction of Ethfinex, specifically through means of the Nectar (NEC) token. 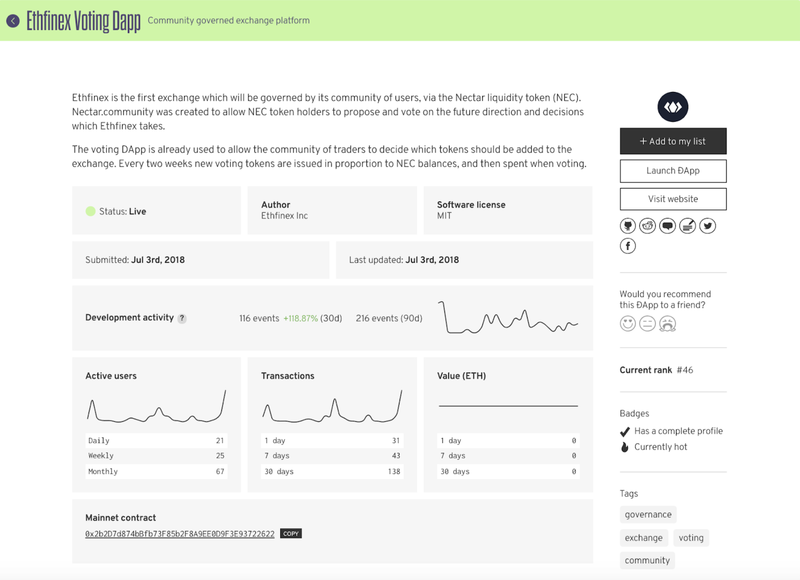 Separate from providing users with a clear ability to influence the governance decisions of Ethfinex, Nectar.community allows NEC holders to monitor platform performance statistics, redeem earned fees and submit proposals to shape the vision of the group as it matures. Nectar.community is a vital tool for Ethfinex to further decentralise our ownership structure amongst NEC holders, putting users in control of the platform. Our vision is to distribute all decision-making amongst our community of users and Nectar.community paves the way for this. At the peak of our latest Token Listing voting round, Nectar.community processed 31 transactions and had been used by 67 unique individuals over the past 30 days. In addition to the upcoming launch of Ethfinex Trustless we are now focusing on optimising the Ethfinex fee schedule to bring more value to traders on our platform as well as additional benefits to NEC holders. Plans for the token sale platform are also well under way and we look forward to share more news on this in the upcoming weeks! All tokens added to the voting list from now on will remain on the list semi-permanently. This means that, as opposed to certain teams being removed off the list every 2 weeks, the list of tokens being voted on will now get longer and longer.50% percent of votes cast on tokens which ultimately do not win will get carried over to the following voting round. This percentage number will decrease by 10% for a specific token after each round. Users can now vote with partial amounts. Thus, if your Ethereum wallet holds 10,000 Ethfinex Voting Tokens you can now choose to cast e.g. 4,000 on Token A and 6,000 on Token B, as opposed to dedicating the full amount to one token. Users who prefer the convenience of off-chain voting will also be able to vote directly from the Ethfinex interface. Ability to put yourself forward as a delegate to vote on behalf of other users. For example, you can choose to put yourself forward as a delegate to vote for, e.g. whichever token(s) would contribute the highest volume to Ethfinex. Other users who do not have the time to vote, or unable to vote for a certain round, can lock up votes and allow the delegate to vote on their behalf. The above alterations are intended to improve general participation in the voting process. We theorise that communities and small voters would feel more incentivised to actively participate in our Community Listing Vote if the risk of non-success wasn’t as high as it previously was. With the new approach our hope is to encourage increasingly fair and active participation from a more diverse group of users. More details about the changes and design intent will follow in a future article, as well as our plans to continue to experiment in this area. Last week we announced our plans for the Ethfinex Governance Summit — a 3 day event taking place in the heart of Switzerland at the end of September. The summit is to act as a meeting place for contrasting minds to contemplate governance models, blockchain-based and otherwise. Ethfinex will be joined by the likes of Aragon, Kleros, Decred, Giveth, Bitfinex, Melonport and more, and the entire event will be livestreamed and recorded for anyone interested to benefit from! We’re making great strides towards the launch of our token sale platform, which would allow users to contribute to pre-vetted Ethereum token sales via the Ethfinex UI. The token sale platform is designed to improve the user experience of token sales, allowing users to sidestep queues through pre-pledging ETH, at the click of a button. The contribution process works to minimise a number of risks frequently associated token sales, namely the protection of personal data, information phishing, token sale overcrowding, gas price errors and mistypings. Three days in and September is on track to be the busiest month since we announced Ethfinex 13 months ago. A majority of the features which allow Ethfinex to stand in a league of its own will come to fruition in the following three weeks and we’re thrilled to be able to present to our users what made them interested in us in the first place. Trading is now live on Ethfinex — get started here. Sign up to our weekly newsletter and stop by our Telegram to learn more about the vision for Ethfinex. Visit our Twitter to stay up to date with announcements, token additions and more. Visit Nectar.community to learn more about the Ethfinex Nectar Token.